This Thai chicken curry soup is quick, easy, comforting, and full of fabulous flavor. A great way to use up leftover or rotisserie chicken! Rotisserie chicken is one of my favorite things to use to make fast, healthy(ish) meals during the week. This leftover chicken soup is one of those meals. 20 minutes for a soup like this? Heck yeah. It’s been a while since I’ve made a Thai-inspired soup, so I figured it was time for another one. This Thai chicken soup has plenty of complex flavors without being complicated to prepare. Thai red curry paste is an easy, ready-made flavor punch. I always keep some in my fridge. I always keep fresh ginger in my freezer so I have some on-hand as well. Thanks for teaching me that trick, Meghan! I also find I waste way less ginger that way. Ever buy it for a recipe then find the rest of it rotting in the depths of your fridge a few months later? Yeah. Another benefit of keeping fresh ginger in your freezer is that it’s extra easy to grate as well. Try it. My easy Thai coconut curry soup has the perfect balance between spices and freshness. It’s not particularly spicy, but ginger and garlic and the lemongrass in the Thai curry paste do provide a bit of heat. The lime juice, cilantro, and basil counter the heat and make that coconut broth even more delicious. Pro tip: In order to make this in 20 minutes, I do a bunch of the prep work while the soup is already cooking (like when the onion is sautéing). I wish I had a bowl of this right now. If you like the look of this soup, you may also like my Thai lemongrass coconut soup, my Thai shrimp curry, or my Thai sweet potato coconut red curry. 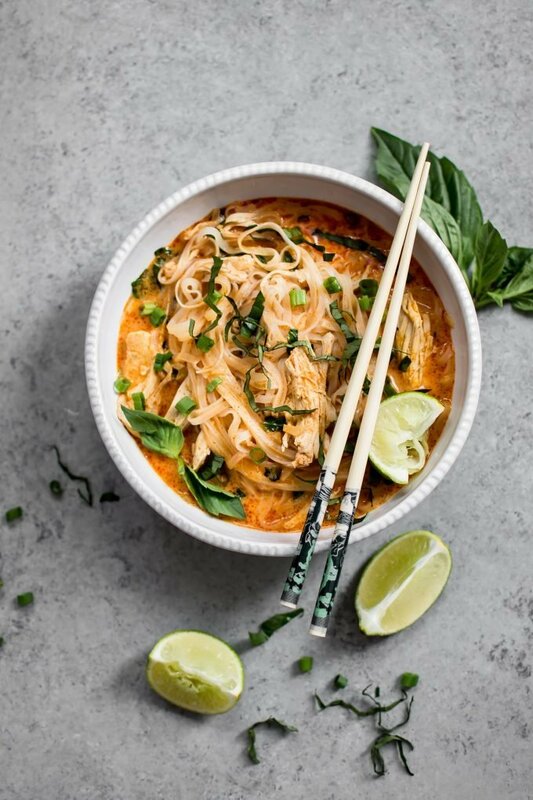 Hope you try this delicious Thai coconut curry chicken soup recipe! Let me know in the comments below if you have. Do you enjoy Thai flavors as much as I do? Add the olive oil and onion to a large pot over medium-high heat. Sauté for 5 minutes, stirring occasionally. Stir in the ginger, garlic, and curry paste, and cook for about 30 seconds. Add the vegetable broth, water, lime juice, and noodles. Increase heat to high and bring to a gentle boil. Stir in the coconut milk and chicken. Reduce heat to medium-low and let the soup simmer for 10 minutes. Test to ensure the noodles are ready (it may vary depending on brand, but most rice noodles will be cooked by now). I recommend the Thai Kitchen brand. Stir in the basil, cilantro, and scallions. Season with salt & pepper as needed. Serve immediately with an extra wedge of lime on the side if desired. The noodles will soak up more liquid the longer you leave the soup. I suggest adding more veg broth if you need to add more liquid (e.g. the next day). I used half a package of Thai Kitchen stir fry rice noodles (not the super thin ones) for this soup. You could add the whole package, but keep in mind it'll soak up the soup broth faster, so you may need to add more broth, especially if you reheat it. I used Thai Kitchen red curry paste. I always keep fresh ginger in a sealed container in my freezer. It makes it much easier to grate that way, and I am never without ginger. I used my handy Microplane grater/zester to easily grate it. This does sound like it’s packed with flavor. Great tip for the ginger. Thanks for sharing Natasha! Thank you!! Yes, it’s such a good tip! Can’t wait to make this, but I think it best to boil noodles in chicken broth and strain prior to putting them in the soup so they won’t absorb all the juice. This looks nice except without the chicken please. Love those flavors! Beautiful photos! I wish I had this for dinner!! OMG, this looks like it’s bursting with flavor! YUMMMM! I almost can’t believe how easy this is!! Looks too delicious to be true! Love this soup! Looks so fresh and tasty, I will have to try it out! Absolutly amazing flavor! I liked more noodles so after we ate all the noodles and still had broth leftover I added more noodles for the second day. Great recipe!! I made this today. So simple, very, very tasty! I used chicken stock and a rotisserie chicken. I added 4 dried Thai red peppers for heat. I’ll make this again and again!!! Making it tonight. Added some vegetables to make it more colorful (red bell peppers, green beans). I’m low carb, so no regular noodles. Unsure if I will use shirataki or just eat as soup. Not in a zoodles mood. Smells fabulous! Just tried it! It’s really good. I just think I messed up with the metrics (I live in Europe) and put too much curry paste… My whole body is on fire lol! Yep definitely messed up, I put about 13 tablespoons…. It was very tasty, however next time I will use a little less water to concentrate the flavors more. I also added a few tsp of fish sauce, and some red peppers for color. My husband and I loved it. The prep was much longer than five minutes. Mincing garlic, chopping onion, cilantro, peeling ginger, grating ginger, squeezing limes, cooking chicken and boiling the noodles took a lot longer than five minutes. It wasn’t a fast recipe by any means, but it tasted good. Hi Colleen, I am glad you liked it! Your additions sound very tasty. Yeah, prep time can definitely vary from person to person. It’s sometimes difficult to calculate. I try to consider that perhaps not everyone is as fast as me (since I cook a LOT haha), but I will explain how I came up with that figure if it helps. I spend a couple of minutes chopping the onion, and then I get on with the rest of the recipe, so I suppose some of the prep is done while the recipe is already cooking, so to me that isn’t really separate prep time since you’re doing multiple things at once. I use frozen ginger (like I mentioned in the recipe), so it takes me only about 30 seconds or so to grate it. I use a garlic press, so mincing the garlic only takes about a minute or so. My chicken was already cooked and portioned out (I used a rotisserie chicken). Omg I made this 3 days ago & I’n still in love with it. I followed the recipe exactly, & it is really good. Ty so much for posting it! I made this soup last night. It couldn’t be any easier. Thought I had enough curry paste but was wrong. Still delicious and will add more paste to left-overs. Thank you for the recipe! So I bought more curry paste and had left over turkey—–what a fabulous use of left over turkey. Thank you!!! Excellent.. so happy to hear you liked it! I am so lazy in the kitchen and don’t like cooking but this recipe was so easy and quick. It looked and tasted amazing and was a hit. I’ll be making this again! Thanks! Needs about a tablespoon of fish sauce and a half tablespoon of sugar to genuinely bring out a traditional bright flavor. There’s a sweet element to Thai food this recipe is missing. I love fish sauce so I second that recommendation! I left it out to make this recipe more accessible to the general public – some are put off by it. Fish Sauce does smell awful. However, once it is stirred in , the fish sauce will work wonders. Therefore, make the recipe and don’t mention it. I absolutely love soup of all kinds and I have made this about 4 times now, my hubby and I LOVE IT! I shared some with a neighbor the last time I made it and she loved it so much that she begged me for the recipe! Thanks so much for one of my new favorite and easy soup recipes! That’s wonderful, Karen! I am so happy that it hits the spot. Thanks for passing the recipe onto your neighbor! Hi Maggie! I haven’t tried, but I imagine it should be fine.